Today is a sad day for lovers of situation comedy. Today is the day that Alan Simpson died. 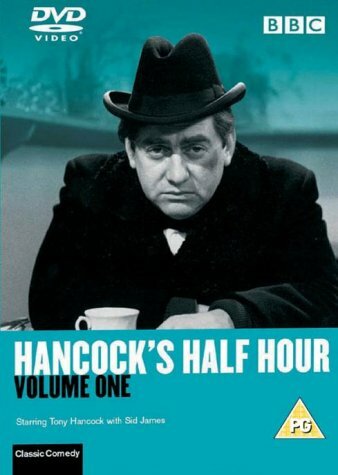 He was one half of the Galton and Simpson partnership that gave us Hancock and Steptoe & Son, studio sitcoms that dripped with character, pathos and jokes. When two of their scripts were remade last year – and shamefully hidden away on BBC4 – the actors may have been different, but the scripts still sparkled. We can celebrate their achievements and look at their legacy, and it feels like we have many times over, but we can also look at the present and into the future and wonder where is the next Alan Simpson coming from? Where are the writers that will pen the next generation of sublime studio sitcoms? As I hope to explain in this worryingly long article (which you may prefer as a pdf), my concern is this: almost all the pathways into mainstream studio sitcom for writers have been closed off or diminished. It is not at all clear how studio sitcoms will be produced in the future in any great quantity, despite the fact we live in a time where there have never been more production companies, TV Channels, development producers and script executives. But before I explain the reasons as I see them, it’s worth asking why I continue to bang the drum for multi-camera studio sitcoms. You know the ones. Those filmed in front an audience where you hear the sound of human laughter. The ones that tend to get the largest viewing figures. Like many people, I love studio sitcoms which is why I struggle against the overwhelming odds to try and write them. I believe there is plenty of life left in those over-lit pantomime contrivances because when they work, they convey a greater truth that transcends the genre. The truly great sitcoms like Hancock and Steptoe demonstrate that, as did the likes of Only Fools and Horses, Fawlty Towers and Porridge; brilliant comedy actors portraying superbly drawn characters, doing expertly crafted jokes, routines and set pieces. No one is saying studio sitcoms are superior, or necessarily harder to write or make. And I don’t just like studio sitcoms. My favourite shows of all time include single-camera shows like Modern Family, Arrested Development and 30 Rock as well as studio shows like Seinfeld, Yes PrimeMinister and Red Dwarf. The general trend over the last thirty years, however, has undoubtedly been towards single camera comedy which, I worry, is slowly killing off the studio sitcom. Look at the BAFTA for Best Sitcom. Since 2000, it’s been won by only two studio sitcoms: Black Books in 2001 and 2005, and Mrs Brown’s Boys in 2012. Compare that with the winner of Best Comedy from 1990-99. Blackadder, New Statesman, One Foot in the Grave, Ab Fab, Drop the Dead Donkey, Father Ted, Only Fools and Horses, and I’m Alan Partridge. All shot in front of a studio audience (yes, even I’m Alan Partridge) and all the better for it. Please forgive me while I labour this point since studio sitcoms are just so achingly uncool you might miss this, but despite the trend in the industry, audiences at home still really like studio audience sitcoms. BBC1 knows this, wants them and likes to broadcast them. When they work they get ratings. The last series of Still Open All Hours averaged 6.3m. The current roster of BBC1 returning studio sitcoms also includes Not Going Out, Mrs Brown’s Boys, Count Arthur Strong and Citizen Khan. And ITV1’s studio sitcom big hitter is Birds of a Feather. And when sitcoms are really working, their Christmas special makes a cracking centrepiece in the TV yuletide offering. On Christmas Day 2016, even though Mrs Brown’s Boys on very late, it still did really well being the “second most popular festive programme” according to the Guardian with 9 million viewers, beating Strictly’s festive special. On that occasion, the Guardian spared us the lecture about why 9 million people were wrong to watch Mrs Brown’s Boys. Studio audience sitcoms can’t just be found on these mainstream channels. UK Gold is awash with repeats of audience comedy, currently showing Ab Fab, Bottom, Keeping up Appearances, My Family, The Vicar of Dibley and One Foot in the Grave – as well as a bootleg Gogglebox called We Have Been Watching in which you watch famous comedy actors watch sitcoms. Over on Dave you’ll see they’ve stumped up for original episodes of Red Dwarf shot in a studio like they used to. 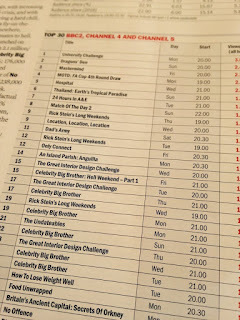 Look at my Twitter feed most weeks and you’ll see that I take a snapshot (right) of Broadcast magazine’s ratings for all programmes on BBC2, Channel 4 and Channel 5. The best performing sitcom on those channels, almost without exception, is reruns of is Dad’s Army. On the day of writing this blog, Channel 4’s schedule began like this: 6.45, 7.10 & 7.35 King of Queens; 8.00 & 8.30 Everybody Loves Raymond; 9.00, 9.30, 10.00 Frasier. That’s eight episodes of studio shows in a row on terrestrial TV. None British, sadly. For that you’ll need to go to E4 or More 4, where you’re rarely more than half an hour away from an episode of the majestic Father Ted or Black Books. Plus London Live shows a lot of Desmond’s. Yes, I know. Still Open All Hours, Birds of a Feather, Red Dwarf, reruns of Dad’s Army, Frasier, Father Ted, Desmond’s are studio sitcoms for nostalgic old farts. They are comforting old shows that remind us of happier, more secure times (like the Cold War, the Miners’ Strike and 9/11). Except younger people also like studio sitcoms. Loads of young people are discovering timeless classics like Blackadder on cable channels. Bear in mind that some weeks, the most popular sitcom on TV is Big Bang Theory on E4. In the UK at least, Comedy Central’s is mostly Friends, Two and a Half Men and The Fresh Prince of Bel-Air. They are trying to wean themselves off those repeats with original shows many of which are filmed in front of an audience like I Live With Models which has just started its second series. There is a desire for new studio sitcoms, but where are the writers of those new Comedy Central shows going to come from? Where are they going to find experienced young writers who even want to write studio comedy? (Believe me, I know the rates of pay, and for that money, they’re only going to get young writers.) And where will the Alan Simpsons of mainstream studio sitcoms come from? It is has been said many times in the last decade that decision-makers in the mainstream really want studio sitcoms. But it has also been said many times that they struggle to find new ones because they just don’t get the scripts. A few years ago, one comedy commissioner said that only about a tenth of the scripts they received were for studio shows. The rest (about 200 scripts) were all single camera shows. 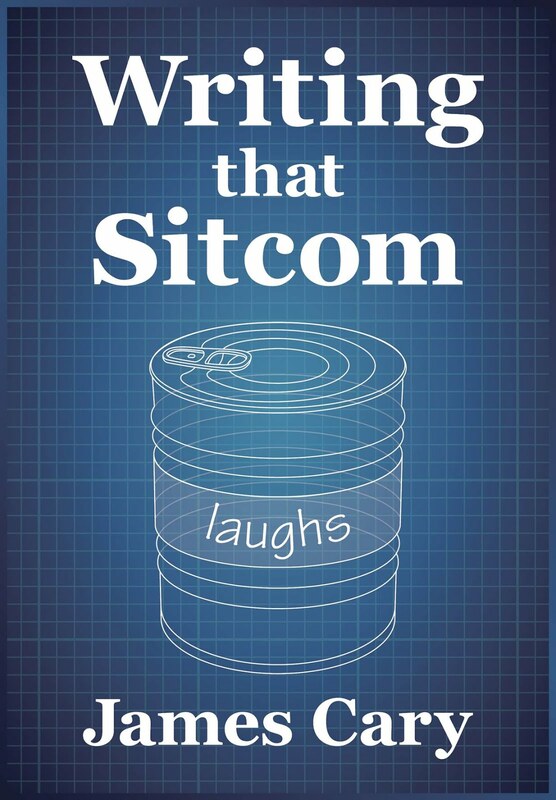 So where will these new studio sitcom scripts come from? At the moment, these shows are drawing from a smaller and smaller pool of talent. Shows like Birds of a Feather, Red Dwarf, Still Open All Hours and the return of Porridge are being written by men who got tons of experience in the 70s, 80s and 90s, or reprising old shows or formats. Mrs Brown’s Boys was honed by Brendan O’Carroll in a live theatre context, as was Count Arthur Strong, which went via radio, and was then bolstered by the highly experienced Father Ted/Black Books writer, Graham Linehan. Other writers in this small pool of talent have moved away from sitcom altogether. Richard Curtis is making movies and saving the world. The rest have moved into high-end, prestigious drama. The brilliant Steve Moffat (Coupling, Joking Apart) is running Doctor Who and Sherlock. The utter genius who wrote One Foot in the Grave, David Renwick, now writes comedy dramas like Jonathan Creek and Love Soup. The sitcom legend behind Men Behaving Badly, Simon Nye, is writing The Durrells. Who can blame comedy writers for turning to drama? For a start, the money’s better, not least because you’re writing double-length scripts, and sometimes more than six at a time. Drama writers are also treated with greater respect than comedy writers who are regularly treated like errant children. We often hear producers and controllers and channels celebrating the wondrous Sally Wainwright, Russell T Davies and Jed Mercurio. Quite right too. They are also given the space to pursue a vision. In so doing, they garner great reviews from critics. Who wouldn’t want some of that? Especially when these same critics lie in wait to stamp on any new studio sitcom, and ideally dance gleefully on its grave when it dies. Studio sitcom is a medium they ultimately despise. Whether it’s the sound of human laughter that is such kryptonite to them, or just the theatrical artifice of the genre is hard to say. But who would bother with a studio sitcom when you’ll only ever win begrudging respect from your industry? Or maybe you’ll get lucky and be described as a ‘guilty pleasure’ (as we had early on with Miranda, until eventually some people admitted to just liking it). Blackwell, Roche & Iannucci. All British. There are still other writers who could be writing 8.30pm BBC1 shows and are writing situation comedy. 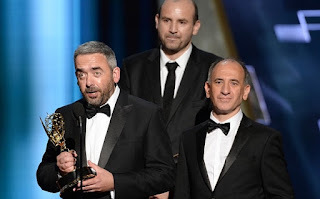 Except they’ve been writing and directing in America on Veep for decent money and critical Emmy-winning acclaim. So there are dozens of people alive today with the ability and experience to write mainstream studio sitcoms. Why aren’t they? What is it about the process, or working conditions that means virtually all of them are doing something else? And if they’re not going to be seduced back, where are the new studio sitcom writers going to come from? Here’s why I’m not optimistic that many people will emerge to fit the bill and why this problem is not going to be fixed any time soon. Firstly, one previous source of studio sitcoms, both writers and actors, was the theatre, not least rep theatre. Eric Chappell entered the sitcom world via his popular play The Banana Box, which became Rising Damp. He then went on to write shows like Only When I Laugh, Home To Roost, The Bounder and Haggard. Plays like Rising Damp are, I suspect, rarely written these days and yet studio sitcoms are more like plays than anything else. And produced even more rarely. Producing theatres need to make their cultural mark. It seems unlikely they would do that by producing one-room farces that could be turned into a mainstream studio sitcom. See? I'm not making it up. If you want that sort of thing, you have to do it yourself, as Brendan O’Carroll did with Mrs Brown’s Boys. 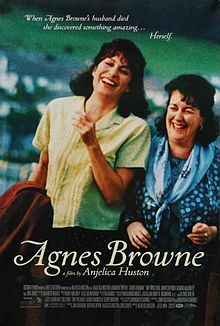 The show actually started on radio and became books – and a movie, yes, a movie in 1999 called Agnes Browne with Anjelica Huston. Yes, Anjelica Huston. But it was the touring theatrical version of Mrs Brown’s Boys that was spotted by Stephen McCrum at the BBC and dragged into a TV studio. Theatre has changed, and there’s not much we can do about that. A play written for the theatre can still become a sitcom. But it’s interesting that the last play which did that very recently, Fleabag by Phoebe Waller-Bridge, became a single-camera comedy. And has won every gong going. Rep theatre, which was essentially knocking out a play every week or two, is the perfect grounding for studio sitcoms, which operate on a very similar basis for writers and actors especially. But rep has gone the way of music hall and variety, and that training ground is no longer there. This is not to say that theatres no longer have any impact on sitcoms. These days, theatres across Britain aren’t filled with people watching original plays (notable exceptions in London and the likes of Chichester notwithstanding). But they are regularly packed out with audiences watching comedians they’ve seen on Live at the Apollo or Mock the Week. Experience would suggest, though, that there are not many acts big enough to be worthy of a prime-time mainstream sitcom slot. And of those that are, why would they want to expose themselves to such a critical mauling? And yet these seem to be about the only people that execs and commissioners have confidence in to create a hit studio sitcom. I’ve had conversations about finding vehicles for this name or that name – many of them speculative from development producers casting around for something to say they’re developing so they can continue to say they’re developing something, or from people far more senior with no imagination who really should know better. It is at least an understandable policy because comedians have an on-stage persona that’s been tried and tested in front audiences (at zero cost to the broadcaster). In one way, this is nothing new. 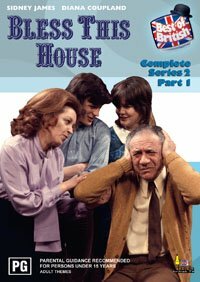 I’m sure that’s how the likes of Sid James ended up in a sitcom like Bless This House. Everyone knew what they were getting, the writers know what they were writing, and the audience had a pretty good idea what they’d be watching. The trouble with this ‘talent-led’ approach, however, is when it becomes dominant. At the moment, it seems to be. But there are serious drawbacks. For a start, it means essentially that a comedian, once they’ve done their show about their own comic sensibility, can’t really do another one without it being basically the same show. Whereas a writer can write multiple sensibilities and situations. In the case of Carla Lane, you not only got the Liver Birds, a show very much drawn from her own experience. You also got the sublime Butterflies and the ratings juggernaut Bread. Another drawback with this ‘talent-led’ approach is that when a comedian isn’t available, or doesn’t want to risk career suicide by being in a duff sitcom, commissioners and development execs might grasp at the next best thing: a real person with a life story. Someone with a unique and interesting ‘authentic’ life experience who gives the show ‘an angle’ that will ‘cut through’. Again, this approach might work and can probably generate a show or two. But where is the confidence in experienced sitcom writers to come up with an idea from their heads? An idea that they can execute? An idea that will basically work and be watchable? Do we really think that a modern day Esmonde and Larbey would even get a script commission to write a show about some painters and decorators, called Brushstrokes? 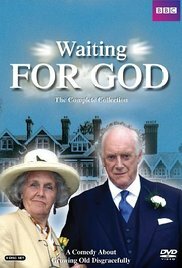 What about someone called, say, Michael Aitkens pitching an idea for sitcom set in an old people’s home called Waiting for God? Both of those shows ran for five series, and were perfectly enjoyable. But, you would now be asked, what is the point of them? Faced with that line of questioning, almost everything is impossible to justify. While we’re about it, right there we have two examples of the talent pool getting smaller. Esmonde and Larbey, who between them also wrote Please Sir!, The Good Life, Ever Decreasing Circles, A Fine Romance and As Time Goes By, are both sadly dead. And Michael Aitkens moved on from sitcom to write episodes of Midsomer Murders from 2006-2014. Good on him. But I digress. Where were we? Oh yes. Theatre. There is another kind of theatre that almost sounds absurd but it’s had such a big studio sitcom legacy that it would be remiss to ignore it: Entertaining the Troops. Read any history of comedy and you will come across a good number of comedians serving in the war and ending up on stage. Not only did this lead to directly to David Croft writing about his experiences with the Royal Artillery Concert Party in It Ain’t Half Hot Mum, it also led to a broad style of mainstream, accessible comedy that was just trying to get a laugh. Croft also joined forces with Jimmy Perry to write Dad’s Army and then Hi-De-Hi, another gang show about a similar kind of entertaining style in holiday camps. These shows paved the way for the likes of Are You Being Served? and Allo Allo, co-written with Jeremy Lloyd. My main point, some time ago now, is that the stage, be it in a theatre, holiday camp or war zone, is very closely related to studio sitcom (more on that here). But because of how theatres now operate, the decline in holiday camps and lack of wars, we’re not likely to get any sitcom writers like Eric Chappell or David Croft in the foreseeable future. But this is not the greatest problem for sitcom by a long way. The second concern is sketch comedy. There used to be a lot of it about. 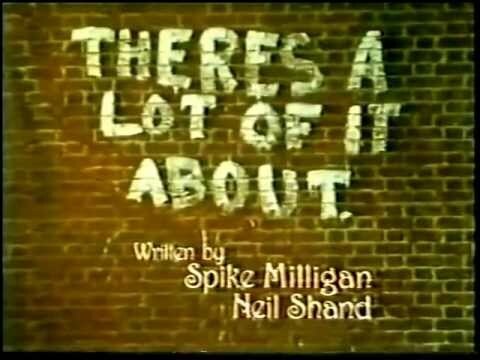 In fact, one of these sketch shows was called There’s A Lot Of It About but I think that was referring to something else. However, there used to be a lot of sketch comedy on mainstream TV, a key training ground for a number of writers who ended up writing studio sitcoms. Sorry! was written by Ian Davidson and Peter Vincent. They had written for The Two Ronnies and Ian Davidson had been the Script Editor in 1978. Along the way he came up with a popular vehicle for a much loved mainstream sketch actor. The Two Ronnies was also a place where the likes of John Sullivan (Fools and Horses), David Renwick (One Foot in the Grave), Andrew Marshall (2.4 Children) and David Nobbs (Reggie Perrin) got some TV comedy miles under their belts. Add up the number of episodes of TV sitcoms written by this crowd alone (remembering to include John Sullivan's Just Good Friends, Dear John, Citizen Smith and The Green Green Grass, (and those other shows by those others writers). We have hundreds, possibly thousands, of episodes of TV enjoyed by millions. Sometimes tens of millions. Some of these episodes are truly great. Many other episodes are just watchable and enjoyable. Again, no small achievement. On the Sitcom Geeks Podcast, I talked to comedy producer Steve Doherty about this. The beauty of The Two Ronnies was the most important thing about a sketch was not an impression, or a persona, or a character but an idea. If the sketch was funny, it went in the show. Today, we have sketch shows – albeit far fewer and in shorter runs. BBC1 has Tracey Ullman’s show, and David Walliams’s. Writing for these shows is a different proposition than writing for The Two Ronnies. On top of this, Tracey Ullman’s show is all shot on location and played to an audience, and Walliams and Friend is about half and half. So the writers of these shows have fewer opportunities to learn that discipline of having to make a studio audience laugh a few times every minute. There are sketch shows, every now and then, on BBC2 which are mainly based around the likes of Harry Enfield and Paul Whitehouse. Again, these are normally character based, rather than idea based. 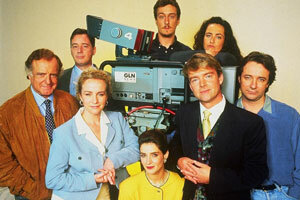 And Channel 4, we are told, have stopped commissioning sketch shows altogether. If true, what a curious decision. My point with sketch shows is purely this: in the past, there were lots of mainstream, studio-based sketch shows like The Two Ronnies, Little and Large, Russ Abbot, Sez Les et al, which were not as dependent on characters and a central performance. These shows no longer exist in a way that benefits the production of studio sitcoms. 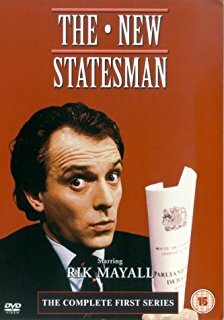 And so a second route to the writing of studio sitcom scripts that might plausibly be placed on the desk of BBC1’s commissioner, has been strangled. 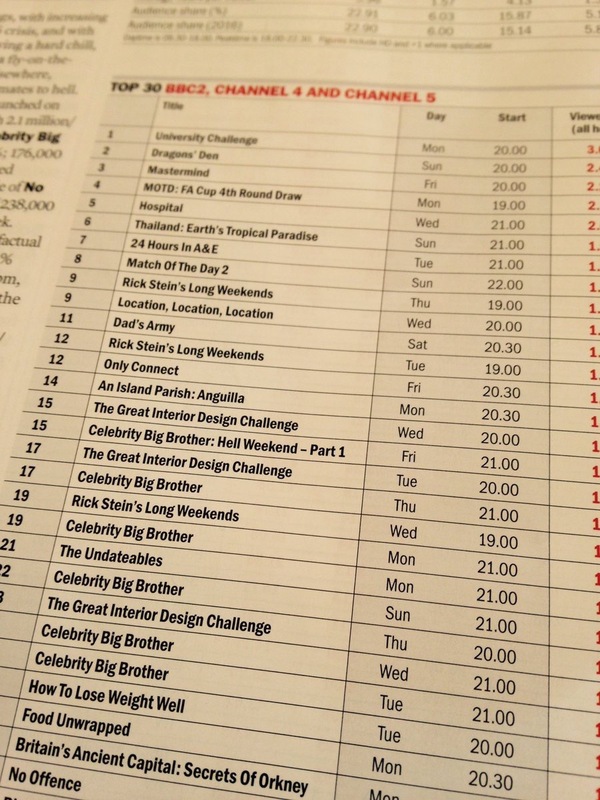 The third obvious source of studio sitcoms for BBC1 is its sister channel BBC2. Traditionally, the sitcoms of today on BBC2 have been the mainstream hits of tomorrow. So what are we looking at down the line? In short, very few studio sitcoms. BBC2 has shows like W1A, Mum, Two Doors Down and Episodes. Since House of Fools and Up the Women ended their brief runs on BBC2, the only returning studio sitcom is Upstart Crow, which is not by a new writer, or even a new-ish one, but sitcom veteran, Ben Elton. And all the better for it. It’s a funny show. ITV2, which has been running for a much shorter time, has given us Plebs and The Job Lot, but hasn’t yet made a studio sitcom, let alone one that could transfer to ITV1. What about Channel 4? In days gone by, the sort of people you’d see on BBC2, you’d also see expect to see on Channel 4 and vice versa. (eg. The Comic Strip cast regularly switched between the two) But the story there is the same. In fact, this is the original prompting for writing this article (before it got out of hand), because it was when looking at the job specification fortheir new comedy commissioner that I noticed something that I thought significant. On the job specification, eight sitcoms are listed as examples of comedy they are proud of: Catastrophe, Flowers, Chewing Gum, The Windsors, Drifters, Man Down, Ballot Monkeys and Friday Night Dinner. Those shows are all very different from each other and have their respective merits, but they are all single camera shows. And that list could also have included Toast of London, Peep Show, Wasted, Crashing, Lovesick and Raised by Wolves. So that’s fourteen half hour comedy narratives. All single-camera. Likewise, Sky’s returning sitcoms from the last few years include Trollied, Hunderby, Moone Boy, Doll and Em: all single-camera shows. The wonderfully daft Yonderland has the feeling of a studio sitcom, but even that is single-camera when it comes down to it. None of this is a criticism, but an observation. Channel 4 and Sky are at liberty to do whatever they like. They need to get ratings, balance the books, satisfy numerous criteria, produce returns for shareholders, hit manifold targets and tick all kinds of boxes. Neither channel probably even has a tiny box marked ‘Support Studio Sitcoms’. Why should they? The supply or encouragement mainstream studio sitcom and writers thereof is not their problem. But it does help explain why this problem is not being fixed any time soon. Which leaves us with the question we began with. Where are the new mainstream studio sitcoms coming from? Where can a new writer learn their craft? As far as BBC TV is concerned, or at least online, how about banging on the door of BBC Three? Do we really think that BBC Three will commission a studio sitcom any time soon? I’m sure BBC Three would say that they will happily consider any script or idea and execute it in the way that works best for the idea. But let us bear in mind studio sitcoms are more expensive to produce than a single-camera show, and so this will take a bigger slice of budget, come under greater scrutiny and may eventually be deemed not worth the risk. And who has the experience to get this tricky format to work? How many comedy directors have experience of multi-cam studio sitcom? Not many. This point about expertise is not an inconsiderable one as the talent base in studio sitcom production is also getting smaller and literally dying out. This means a new writer might end up working with a comedy producer who has never produced a studio sitcom before. Gulp. This is going to be a big worry for them, because in a sitcom, everything has to be alright on the night. You shoot the show in sequence. Maybe a couple of takes. And that’s it. It’s brutal. (As I write here) And if there’s one thing a studio sitcom needs it's this: confidence. In a way, the single-camera model is easier for a producer, director and editor, who can then assemble, or reassemble, a show in the edit, salvage a storyline that doesn’t work, add a montage or some snazzy jump cuts and some upbeat music to paper over a few cracks. Who wouldn’t? It’s another bite at the cherry. Or another level of interference, depending how you look at it. Imagine you’re a comedy producer with zero studio sitcom experience, which way are you going to nudge the writer with a script or sitcom idea that could go either way? Will you have the confidence to get it all right on the night, risk the wrath of execs if it goes wrong? Or will you feel happier piecing together a show in a dark room in Soho. The expertise is shrinking and dwindling, and with that goes the confidence you need for a studio sitcom. Through Paul Mayhew-Archer, I was lucky enough to be invited to work on BBC1 mainstream studio shows including My Family and My Hero. But I continued to work for Radio 4 with a shortlived sitcom called The Pits (starring some guy called John Oliver. Whatever happened to that guy?) and then a sitcom set in Bletchley Park called Hut 33. And then work with Miranda Hart, which led to involvement in the first two series of her TV sitcom, which, of course, began life on BBC2 and transferred to BBC1, showing that system can still work. I’m pleased to hear that BBC Radio is still committed to sitcoms recorded in front of audiences. As a judge for the Writers Guild of Great Britain awards, I listened to a number of decent sitcoms recorded in front of an audience including Ankle Tag, Reluctant Persuaders, The Lentil Sorters and To Hull and Back. I can also testify from my own experience that competition to get shows on BBC Radios 2 and 4 has never been more intense. So intense, I can’t get one on. At the moment, I’m writing the second series of three-part series for BBC Radio Wales called Be Lucky. And I’m grateful for the opportunity. This pressure on BBC Radio is no big surprise, though, because as it stands, BBC Radio is the only realistic destination for those who really want to write studio sitcoms. The problem is that it’s a huge jump from BBC Radio 4 to BBC1 where the stakes and budgets are far higher. Helping writers make it across that chasm is a huge challenge, but currently, I don’t see any realistic alternatives. That is unless Channel 4 appoints a Comedy Commissioner who really likes multi-camera comedy – and goes out of their way to nurture it. Which would at least be a start. It's also available as a PDF here.